On day one, we rose early and escaped Chicago before rush hour. Lake Shore Drive was traffic free, so with coffee in hand, we entered Indiana within 40 minutes. The tollways across northern Indiana and Ohio are mostly flat and featureless, so after five hours we broke up the drive with a long lunch at Great Lakes Brewing in Cleveland. The day’s destination was another four hours down I-90 at Niagara Falls, New York. Lost in a sea of blue plastic. We arrived in late afternoon, got settled in the hotel and then bought tickets for a sparsely-attended 7:00pm Maid of the Mist boat tour. Along with its Canadian counterpart, the Hornblower, these vessels carry thousands of tourists a day to close-up views of the 170 foot waterfalls. From our perch at the front of the upper deck, we enjoyed the gentle mist created by American Falls before the Maid headed right into the center of the pool below the enormous Horseshoe Falls. Water thundered down all around and sheets of wind-blown spray lashed the boat and everyone on it. 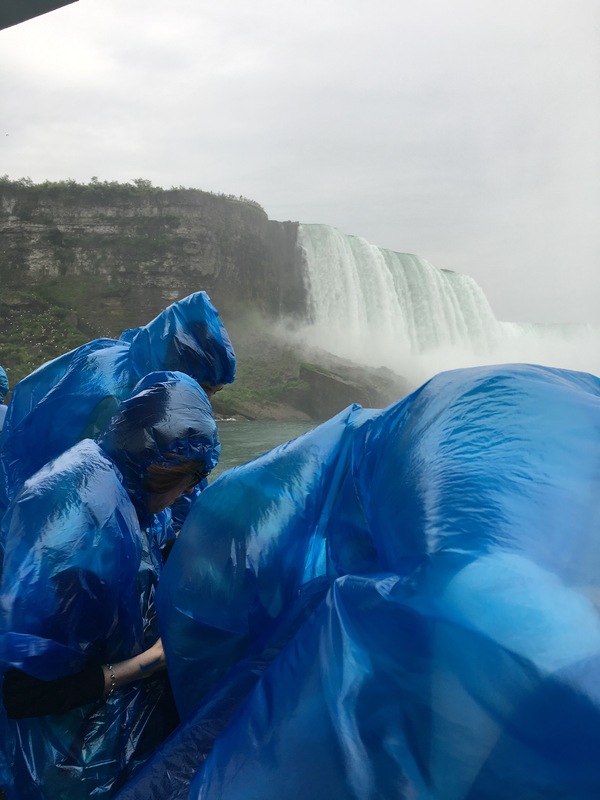 The ridiculously thin ponchos they provide did more harm than good in this situation, inflating in the swirling gusts and covering either our faces or our shorts, but somehow never both. Viewing American Falls (foreground) from the observation tower. On average, 2,407 cubic meters of water tumble into the gorge each second, achieving the highest flow rate of any waterfall in the world over 50 meters high. The perspective from the tour boats is impressive, and it’s one of the few angles where the gaudy casinos in Ontario are hidden from view. After returning to the dock, we avoided the Rainforest Cafe crowd and found a nice dinner of pizza and tapas nearby at Wine on Third. Fireworks were scheduled for 10:00, so we took in the show while giant LED lights bathed the waterfalls in a variety of rotating hues. A sudden downpour dispersed the crowd, but since we don’t melt in the rain, we hung around to enjoy the view from the observation tower. The following morning was another wet one. A Google Maps search for breakfast led us to some amazing pain au chocolat at La Patisserie at Niagara Falls Culinary Institute. The pouring rain and flash flood warnings weren’t a deterrent to the rest of our morning plans, since we were headed to the Cave of the Winds attraction, where we’d surely get soaked. After taking an elevator 170 feet underground, a tunnel exits the base of the bluff and leads to a series of wooden boardwalks built over and around the boulders at the base of American Falls. One platform known as the “Hurricane Deck” allows visitors to get within 10 feet of the water crashing onto the rocks below Bridal Veil Falls. It’s quite the experience to feel the full force of water and wind, the most surprising thing being the bathwater-warm temperature. Don’t worry about your footwear getting soaked because they provide super-stylish free sandals for your journey, but clothing may get damp because the thin, ponchos (yellow this time!) they hand out are no match for the water… a recurring theme here. 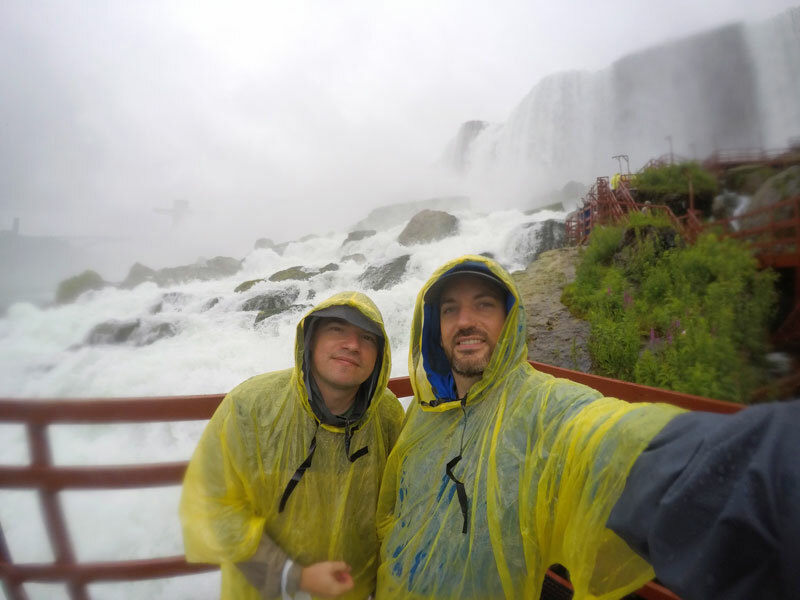 A little moisture was worth it, because this is the most memorable attraction at Niagara Falls in our opinion. The whole area has an odd vibe, with the nature of the waterfall juxtaposed with the wall of high rise hotels across the gorge and the carnival atmosphere of area vendors. The majority of the center of Niagara Falls, New York seems to have been been torn down and replaced with a giant casino, parking lots and generic hotels, so don’t expect a charming or historic urban experience. For more scenic views, head to the section of Niagara Falls State Park on Goat Island. The lovely landscaping was designed by Fredrick Law Olmstead and Calvert Vaux of Central Park fame, and the island features close up vantage points of the brink of both falls. Fort Stanwix replica in Rome, NY. The rest of day two was a highway trek across upstate New York. 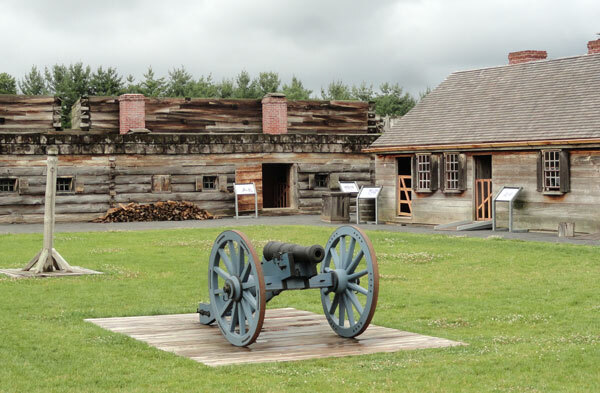 We had a campsite booked in the Adirondacks, and visited Fort Stanwix along the route in Rome. The colonial fort hosted some historic revolution-era events, and the site became a National Monument in 1935. In the 1970s a replica was built from the original foundations up. Today it provides a unique depiction of what life was like when upstate New York was the frontier. Just outside of Rome, the roads became curvy and scenic as we entered the Adirondack Park region. At 9,375 square miles, it contains the largest protected wilderness east of the Mississippi River. 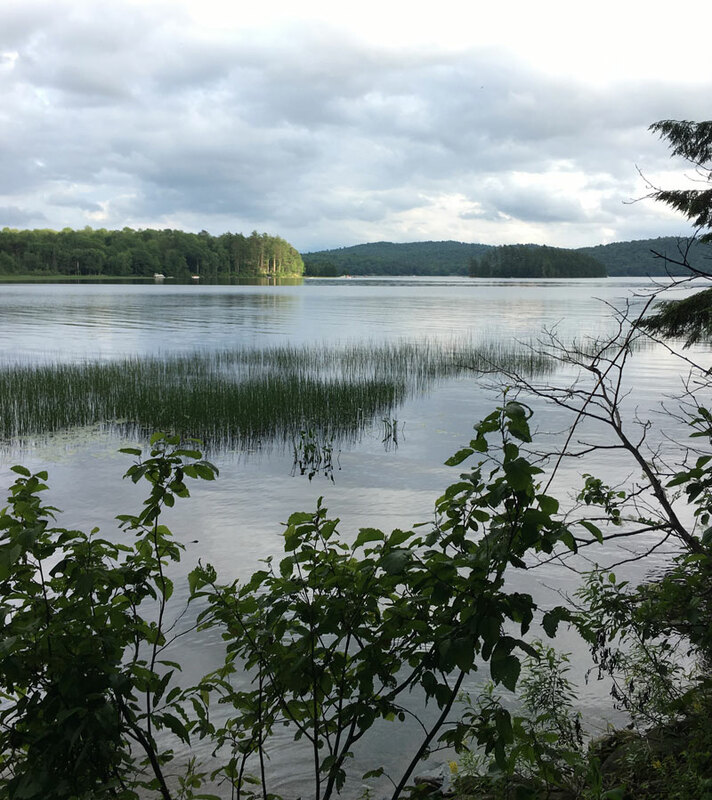 It is home to a wide variety of plant and animal habitats, 3,000 lakes, 30,000 miles of rivers and the highest mountains in New York state. The Irondequoit Inn on Lake Piseco was our stopping point for the night. We booked one of their campsites, but they also offer lodge rooms and cabins for less outdoorsy types. After setting up our tent we took the “glamping” route and walked to the lodge for dinner. The dining room served dishes well above what we could have achieved on the camp stove. We retired to the tent for some card games, and just before we zipped up for the night a light mist began filtering through the trees. Soon it increased to a light drizzle and within ten minutes it was a full downpour splattering loudly on the rain fly. A pitter-patter on the tent can be relaxing for a few minutes, but it hardly let up for nearly eight hours, making it a restless night for both of us. Packing up a wet and muddy campsite is no picnic either, but the Inn has a shower house where we were able to clean ourselves up before the next leg of travel. Freshly showered, we had breakfast in the lodge and set out. Overlooking Lake Champlain and Fort Ticonderoga (center left) from Mt. Defiance. Vermont is probably best known for Ben & Jerry’s Ice Cream, Burton Snowboards and outdoorsy people. Upon entering, two more things that stand out are excruciatingly slow speed limits (boo!) and the lack of view-killing billboards (yay!). Vermont is the second smallest state by population, the 8th smallest by land area, and they proudly declare there are no buildings taller than 124 feet. With just 42,000 residents, Burlington is Vermont’s largest municipality, but being home to the University of Vermont helps give it the cultural character of a much larger place. We walked the quaint pedestrian mall and grabbed a beer at Vermont Pub and Brewery before our dinner reservations at Hen of the Wood. If you find yourself in Burlington, (or their first location in Waterbury) make sure to eat here. Everything was done just right, from the creative cocktails to the locally harvested ingredients and the attentive service. We both immediately jotted down a couple items for potential inclusion in our future “Best of 2017” list. If I gave points for restroom decor, the stuffed deer head in there would rank highly as well. Burlington also was our first test of the Airbnb experience. We’ve been wanting to try it out for some time, but we always have such good luck with Hotwire or a local motel that we’ve never had the opportunity. We ended up in a super cute coachhouse a short walk north of downtown. 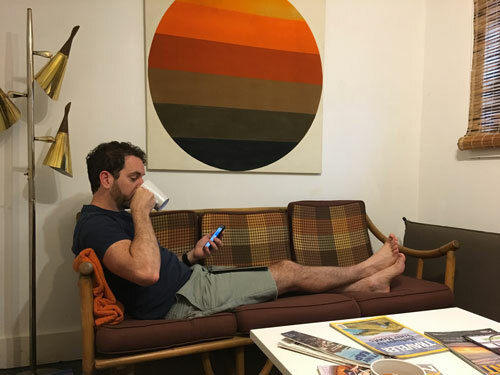 We think we’ll regularly add Airbnb to our lodging searches after this (and another good experience a few weeks later in Toronto). The following morning, we had a quick brunch in neighboring Winooski and then stopped by Montpelier. In keeping with the “Vermont Small” theme, this town of 8,000 is the smallest city to be the capital of a US state. We snapped an obligatory high kick photo on the capitol’s front steps and toured the handsome interior before getting back on the road. After two and a half hours of driving through beautiful, green landscapes of northern Vermont and New Hampshire, we arrived at our home for the next week, the Bingham House in Bethel, Maine. Up Next: In & Around Bethel, Maine. This entry was posted in Destinations, Travelogues and tagged Adirondack Camping, Adirondacks, Burlington, Cave of the Winds, fort stanwix, Irondequoit inn, Maid of the Mist, Maine road trip, niagara falls, northeast road trip, Road trip, Vermont. Bookmark the permalink.